Marc Soares' 100 Classic Hikes in Northern California includes guides to a number of the hikes shown here on Up and Over Carson Pass: Granite Lake, Winnemucca Lake, Round Top, Emigrant Lake, and Lake Margaret. Looking for the Best in California Camping? Hiking on Carson Pass can be as strenuous or as easy as you choose. One of the best hikes is the climb to the summit of Thunder Mountain overlooking Silver Lake. Around Silver Lake and out by Blue Lakes are a number of dirt roads and trails that can be explored. At Caples Lake are trails that take you out to the Carson River Emigrant Trail, a route used by emigrants with wagons heading west during the Gold Rush years. At the very top of the pass you can follow the famous Pacific Crest Trail either north or south. South Nature Trail is a self-guided interpretive path keyed to a park pamphlet. As you tour meadowland, oak woods, plus stands of sugar pine and ponderosa pine, you’ll learn how the Miwok collected and used the bountiful local vegetation. North Trail begins near the museum. It follows a low ridge and loops back to the reconstructed Miwok village. At the village, you can join South Nature Trail or return to the museum via a more direct route past the ceremonial roundhouse. Find the trailhead to Shealor Lakes on Highway 88 1.2 miles west of Silver Lake. This hike climbs, drops, climbs, and then drops again to the lower lake. Along the way you have wonderful views back to the east overlooking Silver Lake with Thunder Mountain and thimble Peak for the backdrop. there is no trail down to the lower lake, so it is a route for experienced cross-country hikers. The trail descends another 500 feet to the lower lake, leaving you with a 900 foot return climb. Anyone interested in emigrant trail history would enjoy the nearly 4-mile hike to the site of Plasse's Trading Post on the Carson Emigrant Trail. Begin at Plasse's Resort at the southern end of Silver Lake. The 4-wheel road passes Stockton Municipal Camp, climbing evenly over the entire 4 miles. Side trips along the way could take you to Hidden Lake or to several early grave sites near the trading post site. Set out from the trailhead next to Highway 88 at the western tip of Caples Lake. Enjoy a scenic day trek to Emigrant Lake, hiking part of the way along the shore of Caples Lake. You'll have plenty of views of Caples Lake on the first half of the hike along level terrain, and then you get a good look up at the West Pass, the highest summit the wagons had to cross while traveling the Carson Emigrant Trail. Camping is not allowed within 300 feet of Emirant Lake. Enjoy a snack or lunch at picturesque Emigrant Lake and then relax on the return hike. Set out from the trailhead next to Highway 88 at the western tip of Caples Lake. Start out along the lake's edge, but after a little more than a mile turn uphill on the trail to West Pass. This is the route of the Carson River Emigrant Trail. The emigrants came down from Carson Pass and crossed the valley where Caples Lake now is before starting the arduous climb to West Pass. Along the way you will cross under ski lifts from Kirkwood Ski Area. Then after mile 3 the serious climbing begins, up the side of Covered Wagon Peak. Be sure to carry water and a camera. Panoramic views from the top are spectacular. The hike up to Round Top Lake is a favorite for anyone camped at Woods Lake. The trail passes the Lost Cabin Mine on the way up. Experienced mountain climbers may push on to summit Round Top (10,381'). Once you have reached Round Top Lake it only makes senses to climb a slight rise and return to Woods Lake via Winnemucca Lake. Fourth of July lake is an ambitious hike for a single day trip. The trail leaves Woods Lake and climbs 1,200' to Round Top Lake and then drops 1,200' to Fourth of July Lake. The return hike on weary legs can be a challenge. Most people prefer this hike as an overnight backpack trip. There are amazing views from Fourth of July Lake. It rests in a pocket overlooking Summit City Creek canyon, nearly 900 feet below. The Pacific Crest Trail crosses Carson Pass just west of the parking lot. Day hikes on the trail are enjoyable because it offers wonderful views. To the south there is no clear destination until you reach Lost Lakes nearly 7 miles out. Most day hikes go out about 2.5 miles to the south and turn around before the trail begins its serious descent. Going north, the Pacific Crest Trail only fluctuates a couple hundred feet in elevation for the first 4.5 miles, all the way to Showers Lake. For a more ambitious hike, if you arranged a shuttle, someone could drive over Luther Pass and up to the top of Echo Summit and leave a car there or be there to wait for hikers. 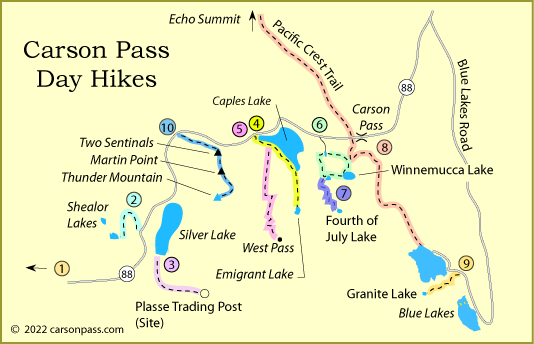 The hike from Carson Pass to Echo Summit is 12 miles over fairly even terrain. The trail never climbs more than 500 feet over the first 9 miles. After that it descends 700 feet to Echo Summit. Wendy Lautner's Day & Section Hikes, Pacific Creast Trail Northern California , shown right, includes many of the day hikes listed on this page, besides covering the Pacific Crest Trail. Little Granite Lake makes an interesting half day hike from Blue Lakes. Start out at the Middle Creek Campground and head west up the trail, passing a tiny unnamed lake along the way. From Granite Lake you have nice views back down on Upper Blue Lake. Fishing is good in Granite Lake for Lahontan cutthroat trout. 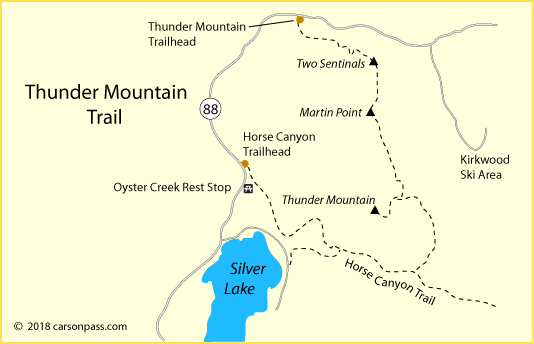 The Thunder Mountain trail doesn't appear on older maps, but it is one of the best day hikes in the Carson Pass area. Begin at the Thunder Mountain trailhead between Silver Lake and Kirkwood. The trail climbs steadily up to Two Sentinels and then along the ridge to Martin Point and culminates on the 9,408-foot summit of Thunder Mountain. Views from the summit are unmatched. For anyone wanting to make a loop trip, a trail continues south and then west to connect with the Horse Canyon trail. Following that trail carries hikers back past the Kit Carson Lodge area at Silver lake and on to the trailhead on Highway 88, near Oyster Creek Rest Stop (4.5 miles). Only a short drive to the south Ebbetts Pass Scenic Byway (Highway 4) serves as the gateway to a number of great day hikes, including hikes at Lake Alpine, Spicer Meadow Reservoir, and at the ruins of old Silver Mountain City. Find out more on Ebbetts Pass Adventures. The maps displayed above are for illustrative purposes only. Up and Over Carson Pass website makes no warranties regarding the accuracy, completeness, reliability or suitability of any of its maps. Every effort is made to provide accurate and up to date information, but we cannot be responsible for errors or for changes that may have occurred since publication. Always confirm information with the service provider and check for any recent changes that may have been made. Check with rangers about the suitability of conditions before setting out on any hike or other forest activity. The information provided on this website is done so without warranty of any kind, either expressed or implied, including but not limited to, the implied warranties of merchantability and fitness for a particular purpose.